My sons department recently authorized the use of the PSA AR 15 Carbine in .556 or .300 ACC Blackout as a patrol rifle. I always want the best for my boy so I ordered one in 300 BO for Christmas last Wednesday and it arrived Friday. 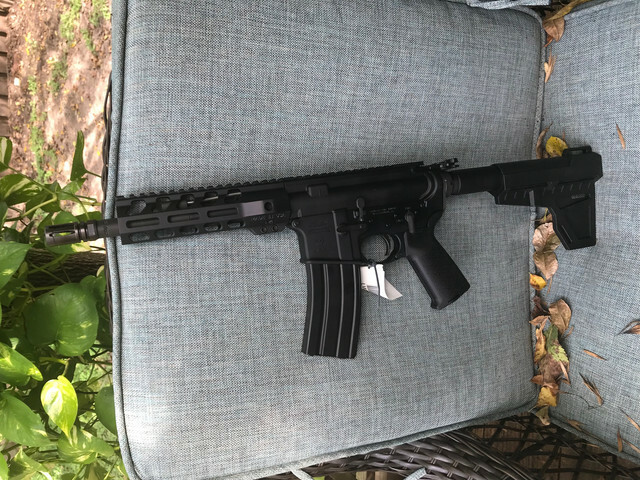 Free shipping, comes with, Shockwave adjustable brace, one mag, Picatinny rail upper and MLOK lower. I'm plan on buying a tactical soft case and a couple of extra mags but he's on his own about any red dot, glass or anything else he wants to put on it. It's pretty dang nice for $550 and I'm thinking of picking one up for myself. Yup, that's me. He kind of mentioned it in passing when we were having supper the other night. Told me all the younger deputies have theirs or are about put their orders in for one. We are a pretty close family, he lives two houses down in the same cul de sac, and I know with one in college and another in high school he has fiscal priorities and a $550 firearm ain't one. I don't mind helping out and I like knowing he has another dependable firearm when he's on duty.